Paddlers train for the Hawai‘i Ka-iwi Channel race, which takes place off Moloka‘i in September. As you read this, a crew of Santa Barbara women are preparing for the race of a lifetime. 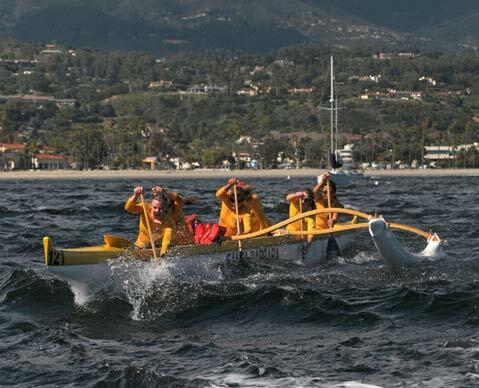 Balancing careers, families, and a grueling land-and-sea training schedule, the ladies of the Santa Barbara Outrigger Canoe Club (SBOCC) have a September date with Hawai‘i’s Ka-iwi Channel, home to the most prestigious — and often most treacherous — outrigger race in the world. Each fall, since 1979, an international field of women’s outrigger teams have descended on the island of Moloka‘i to take on the 41-mile stretch of often white-capped, swell-charged open ocean that stretches from its shores to the neighboring island of O‘ahu. The race is called the Nā Wāhine O Ke Kai (Hawaiian for “Women of the Sea”), and, if all goes according to plan, a team of 10 Santa Barbarans will be there, ready to brave the elements and take a run at glory. It has been more than a decade since Santa Barbara has sent a women’s team to Moloka‘i (there is also a men’s race each year, known as the Moloka‘i Hoe, which has, on occasion, featured a Santa Barbara team), and the decision to jump back into the fray was not an easy one. “Some of the girls started talking about this three years ago,” explained head coach and Hawaiian native Sabrina Kranz. “But I told them that I wouldn’t even consider it until we consistently moved up in the ranks here in California. I don’t want this race to be some sort of crap shoot for us. If we are going to go, we should go prepared to succeed.” And so, after an overall top-10 finish in last year’s California racing season — which runs from May until September and features 14 races throughout Southern California — Kranz, a mother and financial consultant who exudes an intense athleticism, gave the green light to go after Moloka‘i. Of course, there is always a world of hard work in between wanting to do something and actually doing it, especially when that something is a world-class canoe race on the high seas of the Pacific Ocean. To that end, a dozen or so of the 100-plus women in the Outrigger Club, including Kranz herself, have been slowly ramping things up in anticipation of the big event. There is on-the-water training in canoes each week in the Santa Barbara Channel; regular weight-lifting sessions; swimming, running, and yoga on the days in between; and the regular summer race schedule. Add to that the fact that the athletes have regular full-on “day jobs” such as teaching high school art, being a gynecologist, raising a family, or being a physical therapist, and you get an idea of just how impressive their commitment to excellence is. For more info on SBOCC, visit sbocc.org. For info about the September 25 Nā Wāhine O Ke Kai race, visit nawahineokekai.com.